Halfway there to a soccer specific stadium down here, maybe a new one at Evergreen? The soccer field next to the big big hill (Field 1) at the Regional Athletic Center in Lacey is about as close as we get to a soccer specific stadium in Thurston County. It has lights and seating for a large crowd (on a grassy hill). But, it lacks a locker room and any area for media coverage. 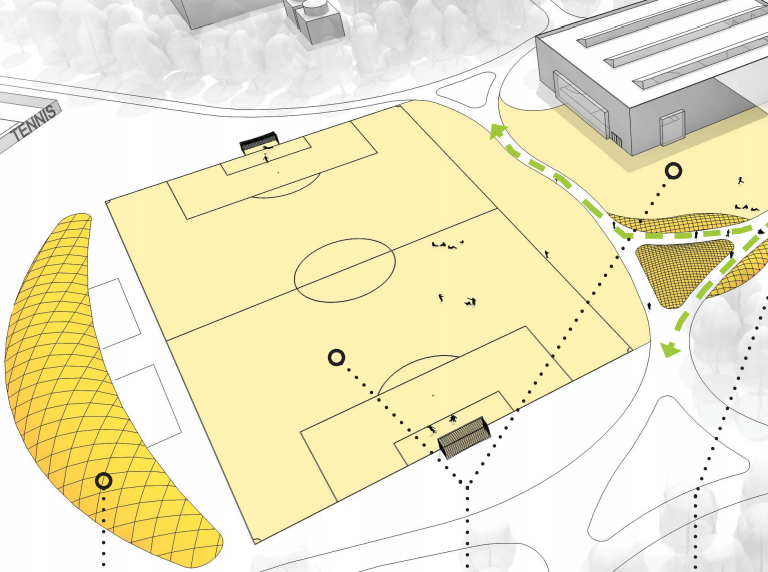 But, now in new drawings of what Evergreen's CRC might look like after a major expansion of Evergreen State College's recreational facilities, we have the makings of a proto soccer specific stadium. The field would be synthetic, so we'd have a year round, all weather surface. Like the RAC, this field would also have a berm, at least allowing for larger crowds. This certainly isn't a typical stadium, which would include at least bleacher seating and possibly be covered. But, heck, it isn't nothing. Also, since the field is directly next door to the CRC proper, semi-pro and high level amateur teams would have access to locker rooms. The only thing this field would lack that the RAC would have would be lights. Also, I assume (and this is where I'm headed) if we wanted an EPLWA, PDL or NPSL team, that some sort of gate would be needed. Because, hard to run a team (even a high level amateur team) if you can't charge admission, right? Am I wrong? So, in the end, the drawings sure look nice. But, before we get anywhere, the funding of the CRC renovations (and there are a lot more in addition to the new field) have to be funded. The money will be coming from the students at Evergreen, so we'll see if they end up voting in the changes. So far a Vote No group has already formed. Voting goes through early March. 1. Seems a bit early, you know? But, Washington Our Home declares snake season has begun. 2. Rebels by Bus has a nice class (and video) over at South Puget. 3. Speaking of South Puget, here's Janine (from Little Hollywood) talking to SPSCC's president. 4. Longshoremen load up a ship. 5. Ken has a pretty thoughtful post here. I knew he'd been the type to vote for her, but I didn't realize she was ill. When should she resign, really? So, if you took a list of contributors of the last two rounds of successful city council elections, what kind of list would you come up with? Here is the entire list, plus a few other spreadsheets to show you how I got there. And, while Chris Garst lives outside of Olympia, it is pretty just outside Olympia. And, Chris is really good people. So, don't get me wrong with that headline. Chris Garst is good. This isn't a list of who contributed the most money, but rather a list of who contributed to the most successful campaigns for city councils. I didn't take a close look at the contribution totals, so many on this top 15 list may have contributed little compared to someone who maxed out on one candidate. But, by a certain measure, these people are more influential than a theoretical single candidate max contributor. In addition to their financial support, every single one of these folks or organizations gave their personal time and civic reputation to the candidate. I'm surprised by the number of elected officials, public officials, former and current. This includes Pratt (Lacey city council), Romero, Valenzuela (Thurston County commission), Walt Jorgenson (former Tumwater city council) and Judy Bardin (Olympia planning commission). Joyce Kilmer, the wife of Olympia city council member (and mayor) Steve Buxbaum is in there too. Only one of the locals that has contributed to the most campaigns is a union bargannign unit that deal directly with the city. While the IAFF Local 468 contributed to five campaigns, the other seven are not on the list. The only other union in the top 15 is a state employee union. Judy Bardin is on the list, and seems uniquely poised to make a run for council, which she recently announced. The brainstorming about getting passenger rail into Olympia is alive! Olympia's best blog took their crack earlier and the Seattle Transit blog did their's yesterday. All smart people all say, sure it could happen. But, there are obstacles. Sure, that makes sense. It hasn't happened, so obviously there are reasons why it hasn't. I was going to reserve this post for a exploration into the past of the old Lacey to Olympia line that was ripped up and turned into a sidewalk. Alright, a glorified sidewalk. But, after all this discussion, I think we need to bring up another topic. Should Olympia be connected by rail to Seattle? You're going to say: Of Course! State Capitol Right?? And, I'm going to respond with a selfish rejoinder. Well, its not like anyone is going to steal the state capitol from us anytime soon. So, why make it easier for people to get here? Right now Olympia's economy is supported by a steady flow of tax money into our community to support fairly well paying and stable state jobs. That's not going anywhere. Jobs come and go, but overall, state work is pretty stable. We're also on the far southern edge of Pugetopolis. So, if overgrowth is going to happen, it'll come from the north. But, in a way, we're buffered from that because back 100 years ago Pierce County stole more than half of the Nisqually Reservation and gave it to the Army. Joint Base Lewis McCord sits out there like a massive empty breakwater against King/Pierce County growth. Eventually Sparkland will reach around through Roy and Yelm and connect with Lacey. But, for the time being, we're safe. Connecting us to Seattle via convenient rail is just one more way to make Olympia a bedroom community living in the shadow of Seattle and King County. And, in at least one part of my brain, more people living in Olympia and commuting up to Seattle for work is not a good thing. Now, using that old Lacey to Olympia rail line that we turned into a glorified sidewalk for light-rail, a way to just get around town? Thats a great idea? Maybe just using the old spur of that lost rail line as a Sound Transit alternative to Centennial Station. I don't know, maybe? Better than downtown Olympia, I suppose. 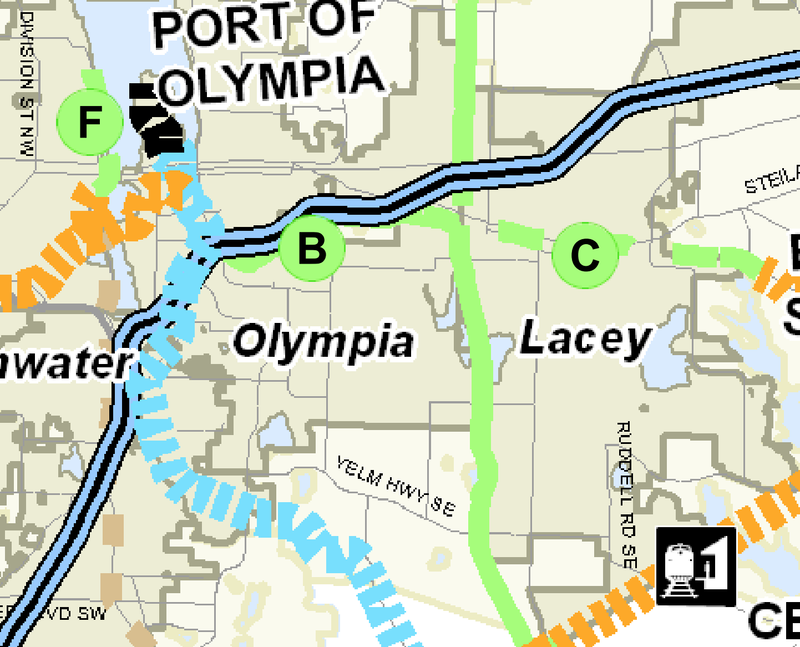 Why not punch a nice passenger line straight into downtown Olympia through Lacey? Connect one of those green lines up with the light blue line: BANG. Passenger rail! I swear I was going to write this piece way before the Olympian had a story yesterday. But, here it is: you know there used to be a rail line that passed through Lacey from a connection with a major line and into downtown Olympia? Did you know that that rail line closed down in the 1990s and was eventually turned into a walking trail? And, did you know this sort of railbanking is sometimes reversed, trails back into rails-style? Unfortunately, what was eventually turned into the Woodland Trail wasn't railbanked at all, it was abandoned and taken over by the cities. Railbanking implies a continued ownership by a railroad company and a temporary use as a public trail. From what I can tell, Burlington Northern totally walked away from the old line. There is one section at the edge of the Lacey border that is still owned by Burlington Northern, but the rest of the old rail line is now owned by Lacey and Olympia. And a discussion between local leaders about 10 years ago about local rail options didn't cover reactivated this line much at all. Here's what I don't get about what was going on in Olympia and Thurston County in the early 1990s. Why not use the old rail line as a passenger terminal, a way to bring Amtrack into Olympia proper? This is the is the same era that saw the old Amtrack shed at East Olympia replaced with a semi-useful station at Yelm Highway. The Centennial Station is still way out in the sticks though. So, instead of taking of half-step with Centennial, why grab the old Burlington line through Lacey and into Olympia and go whole hog and bring Amtrack Trains downtown? I'm sure there would have been logistical challenges with turning a passenger train around Union Pacific line south of town, and possibly other logistical challenges I'm not getting. But, the history I've found no discussion at all about the idea. We seemed stuck on having passenger rail all the way out beyond Lacey and turning over an urban rail line to a trail. Just seems weird to me. I'm typing this post out Saturday night before the Seahawks second Superbowl in two year. The third their entire history. I meant to write this for last Thursday, but I got sidetracked by my sudden fascination with Olympia history. So, on the Monday after the Superbowl, this may seem like the most irrelevant post ever. And, first, before I launch into my main point, just a memory. I don't remember the year exactly, but I do remember the feeling. I was a transplanted Seattle everything sports fan in Delaware. My family had moved there at the beginning of middle school. It was likely the best way I could exercise my feelings that I never wanted to move away from Washington. But, whenever there was a Seattle team on cable sports or any national broadcast, I'd sit down and watch. I spent a lot of time trying to decide whether it was the Detriot Lions or the Seahawks playing. Those that remember the gray Hawks helmets will get that one. Anyway, this particular game was a Monday nighter in Seattle. The era of Cortez Kennedy. Boy, they sucked. The announcers were disgusted. The Seahawks were really really bad. I mean bad. But, I wanted to watch and the announcers openly grumbled why such a bad team would be featured in the national spotlight. I really just wanted to see the Hawks and the interstitial shots of Seattle. Anyway, there's my best (aside from making a 1995 Seattle Mariners scrapbook, also in Delaware) Seattle sports bonafide. And, here's my thought about all the new people who did not notice when Russell Wilson was drafted, but seem to know a hell of a lot about him now. To all the new fans of the Seahawks who will likely not pay much attention when they're losing again. To everyone who owns way more Hawks stuff than me (one t-shirt vs. like 20 Sounders items). To all of you (I won't say bandwagoners) enthusiastic folks: Welcome. You are my people. You weren't with me on that sad Monday night in Delaware, but you're here now. And, that's all that matters to me. I kind of wrote about my feelings on this topic here. But, this what I'm writing now is more personal. I will share one anecdote of new found fandom and then I'll stop. One of my coworkers about 15 months ago could not care less about the Hawks. Despite living in western Washington for years, I suppose sports just isn't her thing. But, she is a writer. She tells stories for a living, so after slowly creeping into following the Hawks a little last year, this year, she's thrown herself into it with a sudden fervor of the converted. And, the way she explains it is that the Hawks are like a really good t.v. show. The games have a plot, they have emotional peaks. There are also interesting characters on the team that shape how the game develops. Quiet destroyer Lynch. Honorable leader Wilson. Wild genius Sherman. And, in the manner that sports is really just entertainment, her entry into the Hawks is an honest one. You may still have not a deep understanding of Seahawk history. Dave Krieg small hand jokes are lost on you, sure. But, you're here. And, you came here your own way. In an honest way. So, thanks. Hopefully you're here for awhile.